Last night (Oct, 28th), I was fixing a very weird problem where text edited using FCK, submitted via jQuery was losing the very first line when it was formatted (color, style) but not every single time… randomly it seemed. At first, I thought it would be something wrong with FCK editor and checked if there was an updated version. I was using 2.5.x on my site and 2.6.5 is current in the 2.x series (and 3.0.1 was just released, note: checking that for another website [http://thirdgenerationco.com]). Since I didn’t want to introduce new features (cause my client freaks out when I do without letting him know), I thought I’d give 2.6.5 a try. That did not solved my problem. My next logical step was checking how jQuery was encoding the text to preserve quotes and double quotes and making sure PHP was getting that right. Which both were. Next, I tried adding slashes and stripping them down, which also did not work. Besides that I just added addslashes() and stripslashes() to preserve double quotes to/from the database. 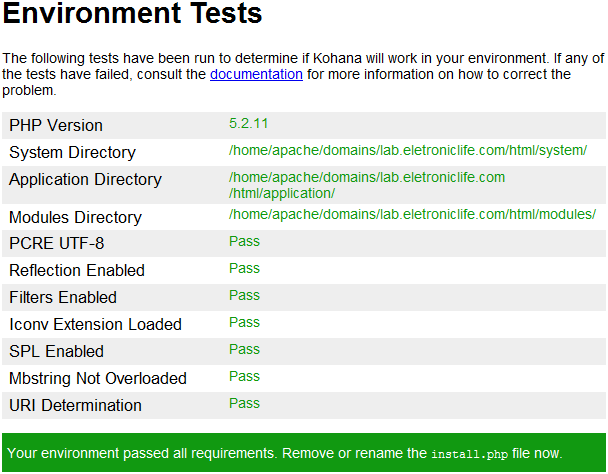 My Kohana v3 installation is not inside a folder, so I’m changing "/kohana/" to "/". And again, extract to a folder on your web server. It’s late here…. so this is all I’m gonna do for now. 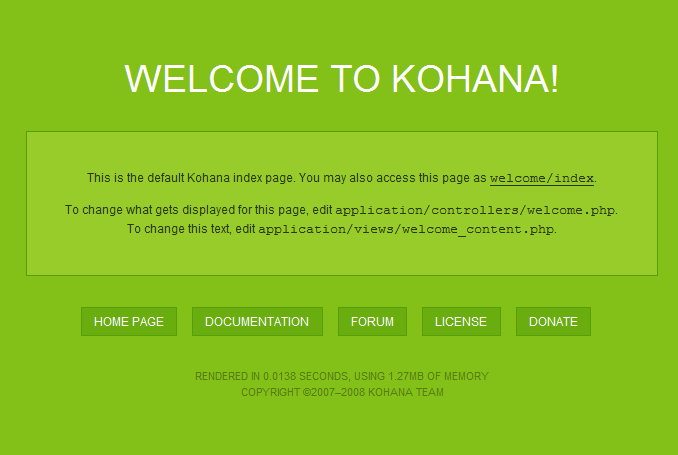 Let’s start working with Kohana (I’ve actually been working with it for a while and thought would be nice to share my experiences)! First thing you want to do is download it and extract it to a folder on your webserver. If you don’t see the output above, check your server settings and logs to help you figure what’s wrong. Feel free to drop me a message, if you need more help after that. As time allows me, I will be writing more stuff about Kohana. This is just a first post to get people started. Like everyone else out there, I’m always looking for some new ways to make an extra money (or more money, for that matter). I’ve been using ClixSense on my spare internet time (read multitasking). It’s not a fast way to get millionaire, but I did receive a $10 check 2 years ago, got to another $10 on my account which I used to buy a Premium membership (Which allowed me to view approximately 500 ads which really helped get the investment back. You pay nothing to sign up as a free member, and can work your way to $10,00 relatively quick. Then my advice would be get a Premium membership, which will allow you to view/click more ads for a whole year. I already reached the minimum payment amount again, just missed the payment date which is the 10th if I remember right. So, I just closed my account on MediaTemple. Posts before this one were created to archive the tickets I had opened with them. Please read all my tickets and note that I really had a hard time trying to get someone to understand the problems with memory allocation were not specific to my application, as they would happen on websites with very low traffic. You called because you were unable to access phpMyAdmin and phpPgAdmin from your AccountCenter and could not connect to the databases through a SSH client. While looking into this issue I found that the migration from the MySQL Grid-Container back into the MySQL SmartPool failed due to a failed SSH connection during the process. 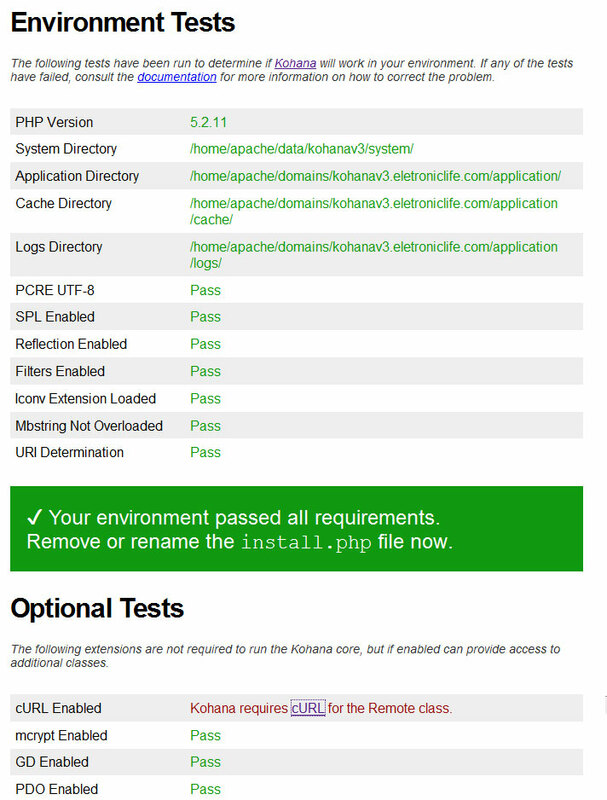 I was able to contact a systems administrator who started the migration process again, as we spoke we were able to verify that the migration had been completed and we had access to both phpMyAdmin and phpPgAdmin. You mentioned that you thought this script should be updated so that if it fails such as it did earlier today it would automatically be run again. A note of this has been made and sent to the (mt) Media Temple requests department for further review. During the course of this call we also reviewed some issues with support requests regarding Account: 144100. At this time I transferred you to speak with my lead technician to get more information regarding the status of the pg_dump error. If you have any further questions regarding your (mt) Media Temple services, please feel free to contact us at any time. Check out our New User Forums! You called in to report that your Postgres server was not working. Your web application was displaying error messages, you couldn’g connect via the command-line and phpPgAdmin was not working. I notified an engineer and they are taking a look at it. I’ll be calling you back this evening to let you know the status. 1) Regarding support request #657283 you’d like to know if the problem with pg_dump versions has been fixed because you want to move back to the Smart Pool and are concerned about database corruption. 2) Your Container that has both MySQL and Postgres running ran into problems tonight and had to be rebooted. You’ve had the same application error displayed in the Smart Pool, after you were bursted and in a Container. I’m going to see if we have any Postgres server logs available. 3) You’d like someone to call you back about these issues. just a small detail, I had the same issues regardless the application I was using (psql, pg_dump, phpPgAdmin) in both the Smart Pool and the Grid Container. None of my "Postgresql websites" have big databases (or tables) and they don’t have high traffic usage at the moment. The application is giving errors about the environment being out of memory. This message can happen in the Smartpool or the Container because you are exhausting all the resources avaliable. The Postgres error logs have been put in the /backup directory and this information can be viewed via the Account Center File Manager. I would advise to look over this information in regards to optimizing the environment. If you need any further insight please to not hesitate to ask. Due to the repeated inconvenience of your PostgreSQL database running out of memory intermittently since you started this account, I am reassigning this Support Request to our Billing Department to add a database container to your account. The first month will be free. If you decide that you do not want to keep the container you will need to close the container before the month is over. If you do not close the container before the month is over your account will be assessed a fee for the container’s usage. Thank you for using (mt) Media Temple! Feel free to let us know if there is anything else we can help you with. We have added a MySQL Container Lite to your account. The billing cycle for this service is 10/25/09 at which time you will be charged $20.00. If you have any additional questions or concerns, please feel free to contact us. You called because your databases were moved into a MySQL GridContainer,and since this has occurred your sites running in a PostgreSQL database are unable to resolve to the database content. An error occurred when the databases were moved to the container which caused the tables in your PostgreSQL databases not to be added to the databases when they were created. In order to have this issue resolved I have reassigned this support request to a higher level employee to resolve. Please anticipate a delay while this support request is reassigned and resolved. In case I choose not to keep the Container, will my databases be moved automatically to the regular pool? You were having a problem with your databases not being populated with tables after the GridContainer move. Our admins were able to recover your data and I restored the tables for you. We don’t currently have an answer for the original issue, but our engineers are working on it. You should receive an email once they have it resolved. Please refer to your Grid-Service "aliofthevalley.com", Support Request # 657007, for the response to this Support Request. If you have any further questions regarding your (mt) Media Temple services, please feel free to contact us at any time. You called because you were unhappy about the way your PostgreSQL databases were bursted and you lost the complete functionality of your databases. We have determined that your request requires the assistance of a higher level staff member or system administrator. Please anticipate a short delay while we re-assign your support request to a staff member who is better equipped to service your needs. Due to the nature of this support request additional time may be needed to provide you with a response. Thank you. Thank you for the phone call. You called in because you wanted to speak with a supervisor about an issue related to your pg databases. I asked if you could submit a support request with the exact problem so I could escalate it if necessary and you asked to speak to a supervisor. I then transferred you to TJ. I’d like to know if I could get any compensation on the fact that my databases were not moved correctly to the Grid Container. We spoke today regarding issues connecting to your database externally. I was able to duplicate this issue and explained that an administrator will take a look into this shortly. Please use support request #661555 for further information on the external connection issue. I was informed that the dumps were failing and the version had to be ignored in order to get them to complete properly. This was done with just "-i". After evaluating the details of this support request it has been determined that the reported issue will need to be logged into (mt) Media Temple’s product bug and feature request tracking database. Issues logged to this system will receive high-priority attention and consideration for resolution in future upgrades and product refreshes. This support request is being marked as "resolved"; however in actuality it is being moved to an internal tracking system. If you have any additional information to add to this specific issue we ask that you update us as soon as possible so that the full scope and detail of the issue is logged. Thank you for your understanding in this matter.